Universidad del País Vasco / Euskal Herriko Unibertsitatea (UPV/EHU) (Spain). This study was conducted within the framework of the EDU2009-10102 project, subsidized by the MICINN (Spain), with the help of grants aimed at supporting the activities of research groups within the Basque university system (Basque Official Gazette 27-VII-2012 Application IT701-13). This study aims to analyze the factorial structure of the newly-created Cuestionario de Autoconcepto Social - AUSO (from here on the Social Self-concept Questionnaire, or AUSO), which consists of two scales measuring social responsibility and social competence. The theoretical proposal which posits that social self-concept is the result of the combination of two basic self-perceptions: competence in social relations and response to the demands of social functioning, is based on a review of human social development theories and previous attempts to measure social self-concept. Participants were 818 students aged between 17 and 52. The results obtained though confirmatory factor analyses support the hypothesis of a structure made up of two correlated factors. In addition to providing a new measurement instrument with appropriate psychometric characteristics and valid criteria that justify its use in both applied practice and research, this study also enhances our understanding of the internal nature of the social domain of self-concept. Key words: Social self-concept; social development; measuring instrument; reliability; factorial structure. Este estudio tiene por objeto analizar la estructura factorial del Cuestionario de Autoconcepto Social (AUSO), de nueva creación, compuesto por las escalas de responsabilidad social y de competencia social. De la revisión tanto de las teorías del desarrollo social humano como de anteriores intentos de medida del autoconcepto social nació la propuesta teórica de que el autoconcepto social resulta de la conjunción de dos autopercepciones básicas: la competencia en las relaciones sociales y la respuesta a las exigencias del funcionamiento social. Participaron en la investigación 818 estudiantes con edades comprendidas entre 17 y 52 años. Los resultados obtenidos, mediante análisis factoriales confirmatorios, refrendan la estructura hipotetizada de dos factores correlacionados. Este trabajo, además de aportar un nuevo instrumento de medida con características psicométricas adecuadas y criterios válidos que justifican su uso tanto en la práctica aplicada como en el ámbito de la investigación, ayuda a comprender mejor la naturaleza interna del dominio social del autoconcepto. Palabras clave: Autoconcepto social; desarrollo social; instrumento de medida; fiabilidad; estructura factorial. Self-concept is central to psychological explanations of both personal wellbeing and psychosocial adjustment (Fuentes, García, Gracia, & Lila, 2011; Rodríguez, Droguett, & Revuelta, 2012). Consequently, for decades now it has been one of the most-studied elements in this particular field of research. At the beginning of scientific psychology, self-concept was predominantly viewed as a unidimensional concept, a kind of global perception of the self. From the nineteen-seventies onwards, however, it became generally accepted that the structure of self-concept is organized in a hierarchical, multidimensional manner. According to the best-known model (Shavelson, Hubner, & Stanton, 1976), selfconcept is made up of a series of academic and nonacademic perceptions, which in turn form three domains: the social, the emotional or personal and the physical domains. For decades, attention remained mainly focused on academic self-concept, or precisely, global self-concept in relation to academic achievement. From the nineteen-nineties onwards, however, a new, extremely fertile, area of research opened up focusing on the dimensions or components of each of these three domains, in accordance with the supposition that, rather than improving global self-concept itself, attention should be directed at trying to improve selfperceptions in its specific dimensions or aspects. This new research area gave rise to numerous studies on physical selfconcept (Esnaola, Infante, & Zulaika, 2011; Esnaola, Rodríguez, & Goñi, 2011; Goñi, 2008), as well as on the specific areas of academic self-concept, such as musical selfconcept and artistic self-concept (Vispoel, 1995). More recently, a model of personal self-concept was tested in our environment (Goñi, Madariaga, Axpe, & Goñi, 2011), distinguishing between self-perceptions of self-fulfillment, autonomy, emotional adjustment and honesty. During the study of social self-concept, two contrasting approaches emerged which aimed to explain people's perceptions of themselves as social beings either in accordance with different relational contexts (Byrne & Shavelson, 1996; Musitu, García, & Gutierrez, 1991; Shavelson et al., 1976; Song and Hattie, 1984) or depending on their assessment of certain competences (such as, for example, social skills, prosocial behavior, aggressiveness and assertiveness, etc.) that are activated during an individual's social life (Infante et al., 2002; Zorich & Reynolds, 1988). In relation to the latter approach, two variants emerged which associated social self-concept with either social acceptance or social competence. Thus, social self-concept is sometimes understood as a person's perception of their social acceptance by their peers, as well as their leadership status and popularity (García, 2001; Harter, 1982, 1985; Harter & Pike, 1984; Marsh, Barnes, Cairns, & Tidman, 1984; Neeman & Harter, 1986; Piers & Harris, 1984). At other times, however, it is explained in terms of social competence, or in other words, a person's performance with regard to social relations, social skills and sociability (García & Musitu 2001; Marsh, Parker, & Barnes, 1985; Roid & Fitts, 1988). Some questionnaires (Bracken, 1992; Marsh & O'Niell, 1984; Muller & Leonetti, 1974) include both dimensions: social acceptance and social competence. What has yet to be clarified, however, is whether these two dimensions alone (social acceptance and social competence) are sufficient to explain the self-perceptions of social development. Social development refers to socialization processes such as the forging of affective bonds, the acquisition of values, social rules and knowledge and the learning of the customs, roles and behaviors that society transmits to its members and demands compliance with (López, Etxebarría, Fuentes, & Ortiz, 2001). As outlined in different conceptions of social development (Goñi, 2000; Green-berger, 1984), from this perspective, maintaining satisfactory social relations implicitly implies abiding by certain social norms that are established in a conventional way to enable peaceful coexistence between individuals living in the same society. The reason for including a new dimension called social responsibility in social self-concept is linked to the fact that feeling accepted by others and feeling oneself to be socially competent do not globally reflect one's perception of one's social development. This approach is reflected in the unidimensional Social Self-concept Scale developed by Silva and Martinez (2007). The problem here, however, is that the scale, which was administered to the Chilean population, provides no data providing evidence of external validity. These attempts to thoroughly demarcate the internal structure of social self-concept have been accompanied by a number of different measurement instruments. From the nineteen-eighties onwards, a large number of questionnaires were developed to measure self-concept. However, despite taking into account the different dimensions of self-concept, including the social one (Bracken, 1992; García & Musitu 2001; Harter, 1982, 1985; Harter & Pike, 1984; Marsh, et. al., 1985; Marsh & O'Niell, 1984; Musitu, et. al., 1991; Neeman & Harter, 1986), these instruments did not aim to measure the internal multidimensionality of social self-concept itself. The few questionnaires developed that did aim to do this (Infante, 2005; Lawson, Mashall, & McGrath, 1979; Ziller, 1973; Zorich & Reynolds, 1988) failed to offer good psychometric properties and provided no data regarding the use of confirmatory procedures to clarify the proposed structure. Based on the above, one can conclude that a comprehensive proposal regarding the internal structure of social self-concept should include the following three dimensions: social acceptance (referring to one's perception of being well-received and well-liked by others), social competence (understood as one's perception of one's ability to function in social situations) and social responsibility (which refers to one's perception of one's contribution to the proper function of society). In accordance with this theoretical proposal, an initial 23-item version of the Social Self-concept Questionnaire (AUSO) was drafted. 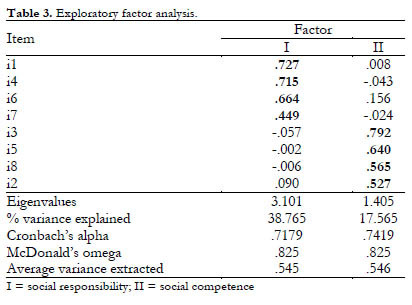 The exploratory factor analyses (Goñi & Fernández-Zabala, 2007) did not enable the hypothesized three dimension structure to be confirmed, but rather indicated a two-factor structure consisting of the social responsibility dimension and a second dimension that combined the responses to ítems referring to both social competence and social acceptance. These results support the idea that one's perception of oneself as a socially competent being and one's perception of oneself as a socially accepted being are so closely related that, in reality, they form a single component, which we propose to call social competence, since this is the more widely used term in psychology. Based on this decisión and after eliminating those ítems that functioned least well in the initial version, the questionnaire presented in this paper was developed. The main aims of this research project were to verify, using exploratory and confirmatory factor analyses, whether or not social self-perceptions measured using the AUSO fit the hypothesized two-factor structure (social competence and social responsibility), and to check the internal consistency of the questionnaire itself. Three different models were therefore analyzed in accordance with the diverse possible groupings of social self-concept. The first was a unidimensional model (M1), according to which all the ítems measured a single, undifferentiated structure. The second model (M2) was made up of two uncorrelated factors (social responsibility and social competence). And finally, the third model (M3) was identical to the second one, with the only exception being that the two factors were correlated. We expected the corresponding exploratory and confirmatory factor analyses to confirm a structure made up of two interrelated factors (social competence and social responsibility), with an adequate internal consistency. A total of 845 students from the University of the Basque Country Teacher Training Colleges participated in the study. Participants were selected using a stratified incidental sampling technique, with different levels and groups being chosen randomly in each college. 27 participants (3.19%) were eliminated from the initial sample group because they failed to correctly complete the questionnaire. The final sample group therefore consisted of 818 people: 201 men (24.6%) and 617 women (75.4%), aged between 17.98 and 52.08 (M = 20.61; SD = 3.64). Social self-concept was measured using a modified version of the Social Self-concept Questionnaire (AUSO) by Fernández-Zabala (2011). The questionnaire has a total of 8 ítems and a Likert-type response scale with five options ranging from 1 = False to 5 = True. It is divided into two scales. The first one, called social responsibility, comprises 4 ítems and refers to the individual's perception of how they contribute to the proper functioning of society: contribution to the common good and commitment to improving humanity; the second one, called social competence, again comprises 4 ítems and measures the individual's perception of the skills they activate in social situations and how they believe other people react to them. In addition to these 8 ítems, two more were added to control the honesty of the responses given and to verify that participants were completing the questionnaire in a responsible manner, rather than just randomly. The questionnaire was administered by the authors during teaching hours in the classroom, after obtaining the corresponding consent of the management teams at the various teacher training colleges participating in the study. All participants were assured that their answers would be completely anonymous, although they were not told what the purpose of the project was (single blind) in order to encourage them to be totally honest in their responses and to decrease the likelihood of the social desirability bias. Since the questionnaire was administered as part of a battery of different measurement instruments, the time required for completion varied between 20 and 30 minutes. Missing data were corrected using the covariance matrix and the multiple imputation technique (MTMM), following the weighted least squares (WLS) method, since the required normality condition was not fully met. The Lisrel 8.8 statistical program for Windows was used for this (Joreskog & Sörbom, 2006). In order to verify the discriminatory power of each of the ítems that made up the questionnaire, a descriptive analysis of the 8 ítems was conducted, consisting of the following statistical calculations: arithmetic mean, standard deviation, asymmetry and kurtosis (Carretero-Dios & Pérez, 2005). When the aim of an empirical piece of research is to study the factorial structure of a questionnaire based on exploratory and confirmatory analyses, the sample has to be divided into two random halves. An exploratory factor analysis was therefore conducted on one half of the sample group using the iterated principal axis factoring approach with oblimin rotation. In accordance with current methodological recommendations regarding exploratory factor analyses (Schmitt, 2011), we opted for this method because the two scales (social responsibility and social competence) were significantly correlated (r = .372; p < .01). In order to calculate the degree of internal consistency we used Cronbach's alpha coefficient and McDonald's omega coefficient, estimated on the basis of the saturations obtained for each item in the exploratory factor analysis. For the confirmatory factor analysis, which was conducted on the other half of the sample group, the alternative or added model fit analysis strategy was used, since this is a procedure which enables an empirical approach to different multidimensional theoretical views of the same measure (Bentler & Dudgeon, 1996; Tomas & Oliver, 1998). The models were compared in accordance with the maximum likelihood method, taking the covariance matrix as the input for the data analysis. The fit of each model was assessed using the most common combination of absolute and relative goodness-of-fit indexes (Esnaola, Rodriguez, et al., 2011; Hu & Bentler, 1999): (a) the ratio between the chi-squared value and the degrees of freedom (χ2 / df), the optimal value of which is under 3.00 (Marsh & Hau, 1996); (b) RMSEA (Root Mean Square Error Approximation), whose score should ideally be below .05, although values of between .05 and .08 are considered indicative of acceptable fit; (c) SRMR (Standardized Root Mean Residual), whose value should be below .05; and (d) the NNFI (Non-Normed Fit Index) and CFI (Comparative Fit Index) indicators, whose minimum threshold of acceptance is a score of .95. Prior to the factor analyses and in order to ensure the replicability of the study, the means and standard deviations for the observed variables (ítems) were calculated (see table 1), along with the matrix of correlations between said variables (see table 2). Furthermore, since any analysis of the psychometric properties of the questionnaire ítems (carried out to determine their discriminatory capacity) requires the combination of four different statistics (mean, standard deviation, asymmetry and kurtosis), table 1 also contains the results obtained for the latter two of these: asymmetry and kurtosis. The mean for the responses given to the different ítems oscillated between 3.53 (i5) and 4.32 (i2), although it was generally slightly higher than the midway point that is deemed desirable for this scale (in this case, 3). In relation to standard deviation, the scores obtained were very close to the recommended value of 1 (Nunnally & Bernstein, 1995), while all the asymmetry and kurtosis indexes were below the established limits (2 and 7, respectively) and are therefore acceptable (West, Finch, & Curran, 1995). The correlation matrix shown in table 2 reflects significant correlations in all cases between the ítems that make up the questionnaire. These correlations oscillated between r = .108 and r = .541 (p < .01). No correlation exceeded r = .90, thus enabling the possibility of multicollinearity between ítems to be dismissed. One vital requirement for conducting an exploratory factor analysis is that the ítems be related to each other, thus enabling relevant groupings to be identified. Given that the correlations between some ítems were low, sampling adequacy was analyzed before the exploratory factor analysis was carried out. The Kasier-Meyer-Olkin index (KMO = .806) and Bartlett's test of sphericity (χ2(28) = 1568.321; p < .000) indicated that the correlation matrix was adequate; in other words, they confirmed that the relationship between ítems was significant and that an exploratory factor analysis was indicated. The configuration matrix resulting from the exploratory factor analysis is presented in Table 3. The results clearly reflect a consistent two-factor structure that is supported by the theoretical approach and which explains 56.33% of the common variance. All the ítems obtained adequate saturation values above the required level of .40 (Stevens, 1992) in their corresponding factor, thus confirming the hypothesized composition according to which the 4 ítems designed to measure social responsibility would be grouped together and the 4 remaining ítems, designed to measure social competence, would be grouped in a different factor, thereby confirming the multidimensionality of social self-concept. The internal consistency of the questionnaire was calculated using Cronbach's alpha index, with an acceptable value of .77 being obtained (Nunnally & Bernstein, 1995). When reliability based on the saturation levels of the ítems in the exploratory factor analysis was taken as a reference, the results improved considerably, obtaining a McDonald's omega value of .904 (average variance extracted= .546). 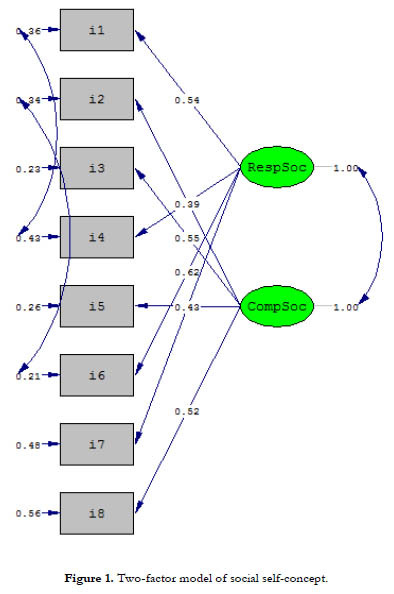 Table 4 below shows the results of the confirmatory factor analysis, which was verified for each of the proposed models. The results indicate that both the unidimensional model (M1) (χ2/df = 26.38; RMSEA = .176; NNFI = .66; CFI = .75; RSMR = .095) and the two-factor model with uncorrelated factors (M2) (χ2/df = 9.01; RMSEA = .099; NNFI = .84; CFI = .89; RSMR = .155) had a poor fit, since none of the goodness-of-fit indexes calculated for either reached the established minimum level. The model which obtained the best results was the third one (M3), with two correlated factors (χ2/df = 3.29; RMSEA = .053; NNFI = .96; CFI = .97; RSMR = .034; Δχ2 M2-M3 = 117.53; p < .001), although it should be highlighted that the score obtained after calculating the ratio between the chi-squared value and the number of degrees of freedom (χ 2/df) did not correspond to that considered indicative of good fit (under 3.00) (Marsh & Hau, 1996), although it was close to this value. Nevertheless, the fit of this model improved considerably (χ2/df= 3.29; RMSEA = .053; NNFI = .96; CFI = .97; RSMR = .034; Δχ2 M3-M3L = 21.81; p < .001) following the progressive liberation of the correlations between the measurement errors of the two pairs of ítems whose modification indexes for the Theta-delta matrix were over 20, due to measurement artifacts external to the instrument (M3L). Specifically, the inter-correlation of the errors between ítems 1 and 4, and between ítems 2 and 6, were liberated, as the result of semantic similarities within each item pair. Figure 1 contains a graphic representation of the two-factor model of correlated factors, corrected through the liberation of these two errors (M3L), since this was found to be the best model for explaining the factorial structure of the AUSO. Although interest in social self-concept is by no means a recent development, there is a distinct lack of studies attempting to demarcate its internal structure, or in other words, to elucidate the number and nature of the principal dimensions that account for said structure in a satisfactory manner. This study presents empirical data that support a theoretical model of social self-concept, along with a measurement instrument, the Social Self-concept Questionnaire (AUSO), that was developed in accordance with said model. It is a fast screening method for adolescents and young adults that offers good psychometric characteristics that justify its use and application in both applied practice and research. Thus, the instrument is a useful tool that enables a more precise identification of those students who experience difficulties in their social relations, in order to permit the design of appropriate prevention programs. The results confirm the validity of the initial hypothesis, dismissing the unidimensional model (which cannot be overlooked) in which social self-concept is understood as a single factor, and finding psychometric support for the two-factor model with correlated factors, based on two liberations of covariance between ítems. Two basic components repeatedly appear in previous studies on the nature of social selfconcept: social competence and social acceptance (Bracken, 1992). These components tend to overlap, since one's perception of oneself as a being accepted by others is simply another way of assessing one's competence at a social level. Nevertheless, the results found here provide empirical evidence supporting the two-factor proposal (social responsibility and social competence) with interrelated factors, which encompasses those aspects of social development which are necessary to obtaining a more comprehensive view of social self-perceptions. It is not enough just to perceive oneself as socially competent; in order to ensure adequate adaptation to the social milieu in which one is immersed since birth, one must also understand and respect the structure of society. Differentiating between specific components within generic constructs is proving to be a timely, necessary exercise in psychosocial fields such as social support (Wongpakaran & Wongpakaran, 2012), burnout syndrome (Manzano-García & Ayala-Calvo, 2013; Rodríguez & Fernández, 2012), wellbeing (Rodríguez & Goñi, 2011) and self-concept (Tomas & Oliver, 2004). Having a precise idea of the different components that make up these constructs opens up new avenues of research for psychological understanding and intervention. This coincides with the theoretical assumptions of Marsh and Shavelson's model (1985), according to which global self-concept is made up of various domains (academic, personal, social and physical), each of which is divided into a series of sub-domains, facets or more specific dimensions. One of the principal postulates of this model is that, although global self-concept itself is resistant to change, its specific dimensions can be modified, and therefore require specific psychological intervention. Indeed, it is precisely intervention expectations in both the field of physical education and the clinical context which have, from the nineteen-nineties onwards, driven research into physical self-concept. Direct relationships have been identified in this last construct, along with a large number of social-personal traits, such as physical activity, body mass index, healthy living habits, psychological wellbeing and anxiety (Infante & Goñi, 2009). Identifying these types of connections is extremely valuable, since it reveals new perspectives from which to approach educational interventions designed to help individuals achieve better personal adjustment. A similar contribution may be expected from a more precise knowledge of the structure and dimensions of social self-concept, a variable which is clearly related to elements such as psychological wellbeing, which are vital to our health (Fernández-Zabala, 2011). Having a measurement instrument with adequate psychometric characteristics, such as the AUSO, will enable a more precise understanding of the function of self-concept, and each of its components, in human behavior. In short, this study fulfils the aim of providing an adequate psychometric measurement instrument of two different dimensions of social self-concept, which supports the widely-accepted multidimensional view of self-concept. However, it also raises a number of unanswered questions. The results fail to completely answer all the questions raised regarding the multidimensional and hierarchical composition and structure of self-concept. It would, for example, be interesting to analyze the relationship between social responsibility, understood as a dimension of social selfconcept, and the moral dimension of personal self-concept, since these are two separate dimensions both related to social life. This opens up a number of new avenues for research, just as this view of social self-concept raises the need to study the relationships which exist between each of the dimensions and other psychological variables, such as social skills, social support and even social status. C/ Juan Ibáñez de Santo Domingo, 1.